In my July 28th article, I shared with you a wonderful day of discovery in the Lake Como area. Today, I want to share with you another day that my wife and I will always cherish…it’s one of those Top-10 Days…maybe even a Top-5 Day! It just might be in the Top 1! Where: The Amalfi Coast of Italy. When: The time is early June. Who: My wife, Ellen, and me. 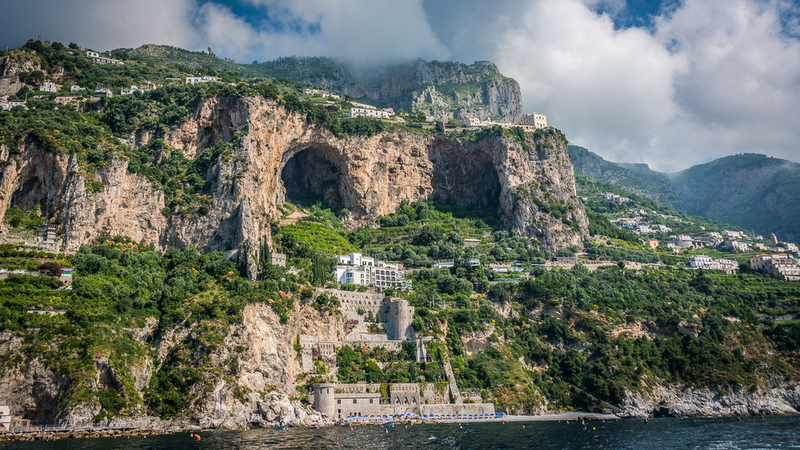 What: An unforgettable day boating along the Amalfi Coast on the way to the Isle of Capri. Why: Well, why not?! It was high on our Italy bucket list and here we were. How: We asked our concierge at the beautiful Grand Hotel Convento di Amalfi to give us a hand in figuring out the best way for us to make a day trip to Capri. She came through. Our base of operations on the Amalfi Coast was the Grand Hotel Convento di Amalfi, sitting high above the town of Amalfi. This former convent has been converted to a gorgeous white-washed hotel that can be seen spread across the top left in this century-old photo. Our concierge scheduled a pickup at the Amalfi’s marina at 9:00am, where we were met by, Gian-Carlo – the captain of the Blue Angel. Gian-Carlo’s Blue Angel is a 38’ Itama, built in Italy – a gorgeous boat with a rear deck comprised of thick, fabric-covered pads for our lounging pleasure. In the two following photos, you can see how our day started as we headed out of Amalfi Town. You can see the modern day Grand Hotel Convento di Amalfi in the left-center of the photo below. Here is a typical view of the coastline with villa after villa going up the hillside. See the horizontal rows of vegetation? Lemons. Lemons. Lemons. The whole of the Amalfi Coast is covered with lemons. And what does one do when given so many lemons? They make limoncello, of course. 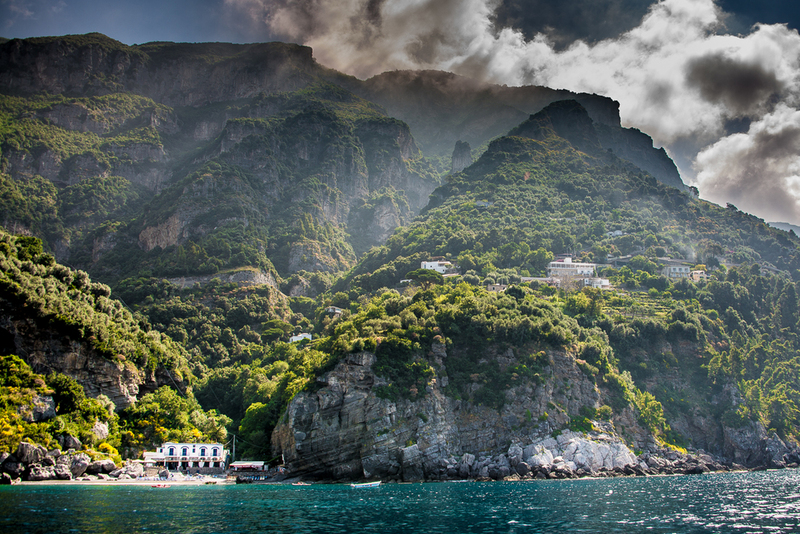 Amalfi is the center of the limoncello universe. Our journey found us slowly traveling the coast with views such as those below. Stone roadways and buildings have been erected over hundreds of years, and seaside restaurants are in abundance. And there are dozens of stone towers (torre) like the one below all along the Amalfi Coast. These towers were erected as an early warning system to alert the coastal towns of invading Muslim pirates, who captured and sold as slaves over 1,000,000 people, including many US merchants. The United States had a big part in defeating these marauders, as President Thomas Jefferson sent the newly formed US Navy, carrying the US Marines in their first battle, to defeat these pirates. We were successful in 1805 after the Second Barbary War. This is where the line in the Marine Hymn “…to the shores of Tripoli” originated. OK, that’s the end of today’s history lesson. Each of the hotels along the coast has access to the water’s edge – not necessarily to a beach, as they are few and far between. Here is a beauty-of-an access stairway. You really, really have to want to get to the water to challenge these steps. Next up, we see the stylish town of Positano, as seen below. By road, Positano is 9 miles west of Amalfi. As it takes about 40 minutes to drive from Amalfi to Positano, you can see that your average speed will be about 15mph. 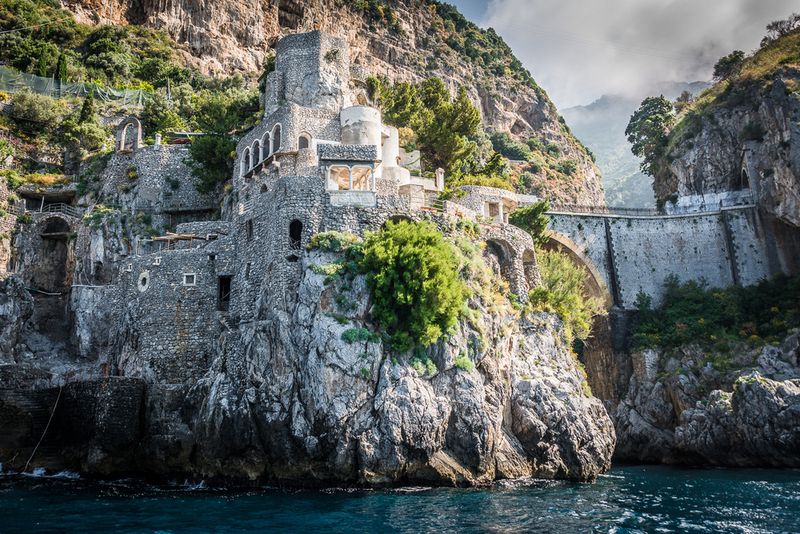 If you ever plan to drive the Amalfi coastline, keep this in mind. We have never been on a narrower road with more bends, blind curves, buses, autos, motorcycles, joggers and women with baby carriages. 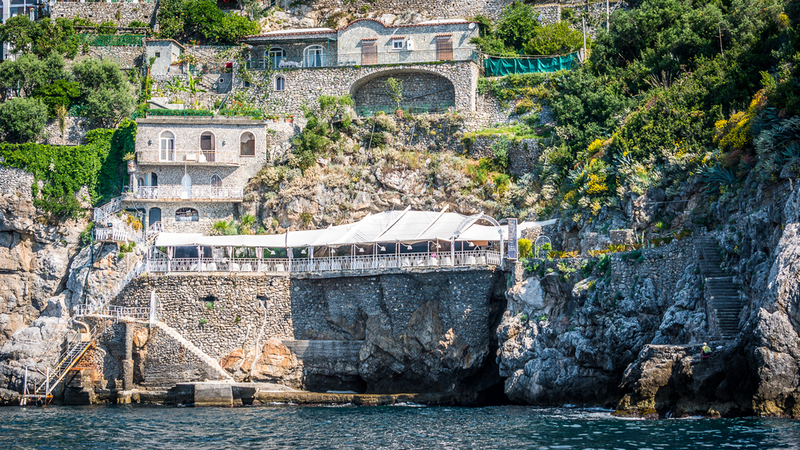 If you stay in Positano, your hotel will more than likely be located somewhere on the hillside. Like a bit of exercise getting to town or the beach? You’ve got it! And the beach sits right there with the town. Hope you’re not shy! Now, we say goodbye to Positano, as it’s time to head to the Isle of Capri. And along the way, Gian-Carlo continues to take care of our needs. Capri is both the name of a town and the island upon which it sits. Capri (pronounced ‘cap-ri by the Italians, with emphasis on the first syllable) is an island located in the Tyrrhenian Sea off the Sorrentine Peninsula, on the south side of the Gulf of Naples in the Campania region of Italy -- got that? As we made our way to the Piccolo Marina (Small Marina) on the east side of the island (the Grande Marina is on the west side of the island), we passed by the rock formations named The Faraglioni, or The Stacks. The natural opening in one of the outcroppings is called ‘The Tunnel of Love’. Couples sailing through that opening are promised blissful love for all time, or something of that nature, so I think my wife and I are pretty well set, now. One of my clients who has the following photo in her office lyrically says that “it graphically portrays her fondest memory of the coastline of Capri -- with the colorful towering limestone cliffs meeting aqua waters”. ...and Green Grottos. Chilly, but super refreshing! We’ve been sailing for about 3 hours, so it’s now time for lunch. Here is our lunch spot. The Torre Saracenas Restaurant is open for lunch from April to October, so we’re in luck. As we're arriving by a large boat, they sent a smaller skiff out to shuttle us to their dock. As we look back, Gian-Carlo is preparing our boat for the afternoon return to Amalfi. Nice boat, huh? At this restaurant, you get to pick out your lunch from these tanks. Here is Ellen taking stock of the available wares, caught just that morning. We started with a bit of vino bianco. …until our fish was presented to us. …we dived into our scrumptious lunch. Now, let’s finish that bottle of wine and head up to the town Capri. Our waiter called us a taxi and we were whisked away. OK, so the town of Capri is pretty much like many other small Italian hill town, except that the ‘streets’ are really, really skinny, and they have to use these really, really skinny carts for deliveries. We were able to find a couple of souvenirs as we shopped Capri style. As we waited for our tender to take us back out to our boat, I snapped this photo of the green waters of the harbor. Now it is time to head back to Amalfi town to end our day on the water and the Isola di Capri. So, how was our day? Does this seem to be something that you would like to do? Well, I can tell you that we sure enjoyed our day exploring the Amalfi Coast. They say that a picture is worth a thousand words. So, I will try no further to express to you our feelings about this memorable day. I will let the photo below be that expression. 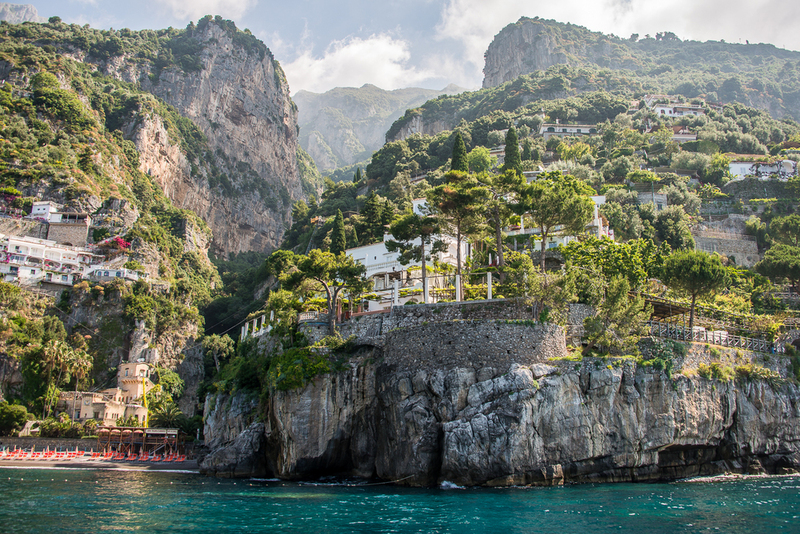 Have you been to the Amalfi Coast or to Capri? Leave a comment with your own experiences, below.